In-wall speakers are one of the best choices when it comes to listening to good quality sounds without cluttering up your decor. They are ideal for use in places where floor space is at a premium. Are your speaker system (sound bar system, floor speaker…) or home theater speaker towers taking too much of your living room space? Do you want to enjoy surround sounds without placing bulky speakers in your living room? If yes, then you might need to install the in-wall speakers. 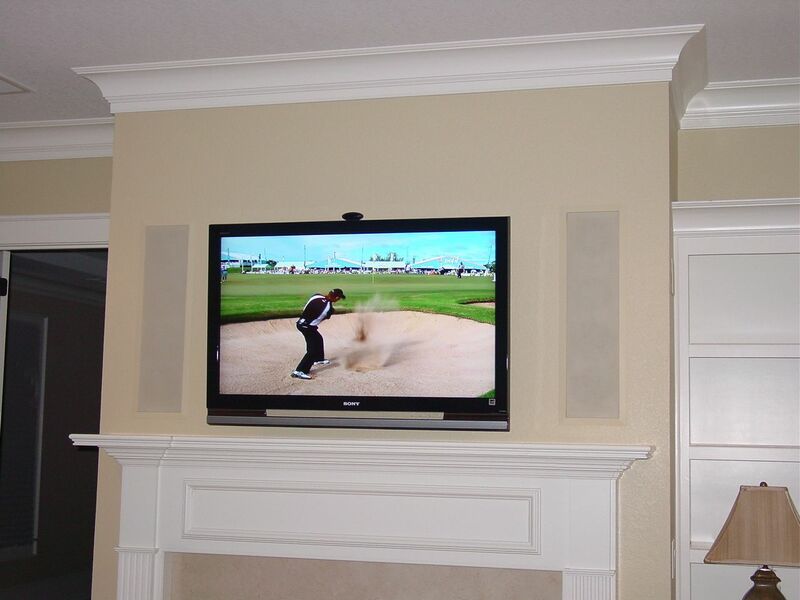 Most people consider the in-wall speaker installation a daunting prospect on a DIY approach. But since you are here, we are going to take you through the step by step details of how to install in-wall speakers perfectly. So you won’t have to call on a professional for help. Your speaker placement will determine the system sound quality. Ideally, the left and the right speakers should be placed within 6 to 10 feet apart at ear level when sitting. A distance of at least 3 feet should also be maintained to avoid the boomy bass from boundary effect. The center speaker should be positioned within 1 to 2 feet above or below the center of the right and the left speakers where possible. For surround use, the speaker should be positioned between 5 and 7 feet above the ground directly on the either side of the listening area. Before installing the speakers into the proposed location, there is a need to check if there are wires, pipes or studs behind the wall that can hinder or make the installation process more difficult. These obstructions can be detected by boring a 0.25-inch hole into the wall and inserting a coat hanger (or a 6-inch piece of stiff wire) bent at a 90ᵒ angle. You can then feel for any obstruction by moving the bent coat hanger you inserted into the wall. If an obstruction is found within your proposed location, patch the hole you made and find a different location to install the speakers. You should equally locate the wall studs, and this can be done by using a stud locator or by tapping on the wall. Try to install each speaker between the wall studs. Note: if you hit anything or an obstruction while drilling, stop immediately and patch the hole with drywall material. Find the speaker template. Most in-wall speakers come with a template. If yours, however, comes with no cut-out template, you can use the cardboard insert from the packaging. 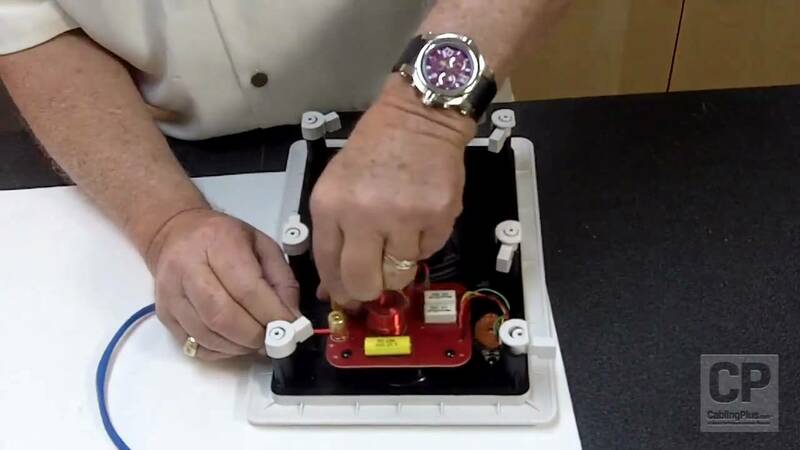 Trace out the speaker with a pencil and cutout the template. Now, tape the cut-out template to the wall at each proposed speaker location and trace an outline with chalk or a pencil. Using a level, make sure the template is straight and properly aligned. Drill a hole into the marked outline and cut out each opening carefully with your drywall saw or a fine-tooth keyhole saw. Don’t bother yourself too much about the rough edges around the cut since the speaker frame is going to cover them. Running the cables overhead from the basement or attic space. 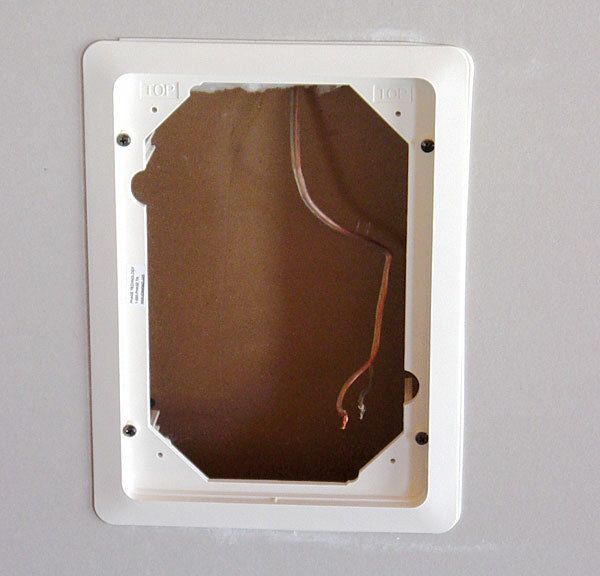 To do this, make a small hole through the stud that caps the wall, run the wires from the attic or basement and pull it up/down the wall with the fish tape. Running cables through the wallboard by making a shallow groove directly and laying the cable into it. And then patching the groove with drywall material after installation. Inspect for accessibility where the cables will be installed and decide on which application would be suitable for your home. Choose the speaker cable installation plan that suits your need. Run the cables and be careful not to cut the wire at any location in the run. Then run the cable from your amplifier or receiver to the first speaker using the fish tape. Repeat this step to run other speakers. After connecting the wires to your audio system, cut and strip the wires at its different connection. Make sure you mark each cable after stripping to identify the runs to the speaker and the amplifier. It is important to identify the polarity when making connections as a wrong connection can damage your audio system. Most wire cable comes with a color jacket insulation jacket which allows for easy identification. Connect the wire to the amplifier; make sure the right speaker is connected to the right and the left to the left. Ensure that the (+) and the (-) connection on the audio system corresponds to the (+) and (-) on both speakers. After the connection, pull the wire gently to check if the connection is secure. If you need to paint the speaker frames and grilles to match the color of your walls, you’ll have to do so before installing them. The best way to do this is through spraying, but the speaker components should be masked to avoid painting them. It is also important to use light coats to avoid clogging the grille perforations. Place the speakers on the wall. Fasten it to the wall with the screw using your screwdriver. Be careful not to fasten the screw too tightly else the grille won’t fit properly. Then place the grille gently into the frame. Switch on your audio system and test for sound production through the speakers. Begin the test at a low volume; this will help prevent damages to your audio system in case you made a wrong connection. Adjust the EQ controls once the speakers start working correctly and then sit back and enjoy your music. Do not use a small gauge wire for the cable installation. It will limit the sound and weaken the bass response. You are advised to use a good quality hook-up wires for the speaker cable installation. For instance, 18 gauge wires are recommended for runs less than 50 feet. 16 gauge wire for runs between 50 and 100 feet while 14 gauge wire is recommended for runs that are above 100 feet. Insulate the speaker openings if it is not insulated. Add insulation-grade fiberglass. This will help absorb unwanted sound waves coming from the back of the speakers, reduce vibrations within the wall and improve the sound quality. Handle the grilles with care. They’ll become difficult to use once they get bent. Be careful when handling the speakers. Do not press the twitter as this can damage it, cause distortion or affect its performance. Installing the in-wall speakers is not as difficult as it seems. You can now improve the aesthetic value of your home and enjoy good quality sounds without having to call a pro. Step up the game, buy and install your in-wall speakers and enjoy the taste of quality.